a new friend, a new love, a new country." 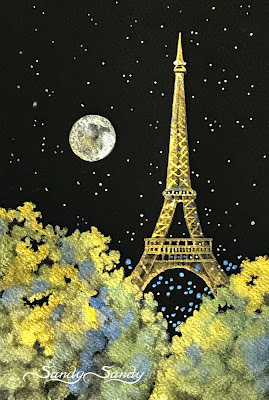 Come create 'The Eiffel Tower at Night' in metallic watercolor on Stonehenge Aqua Black! What a wonderful class we had!! Joy, fun and laughter take planning." This is one of the demo pieces I did for tomorrow's Alcohol Ink Studio Class here at The Sandarosa. Now WHOO doesn't love having fun, while learning how to paint whimsical owls in alcohol ink? 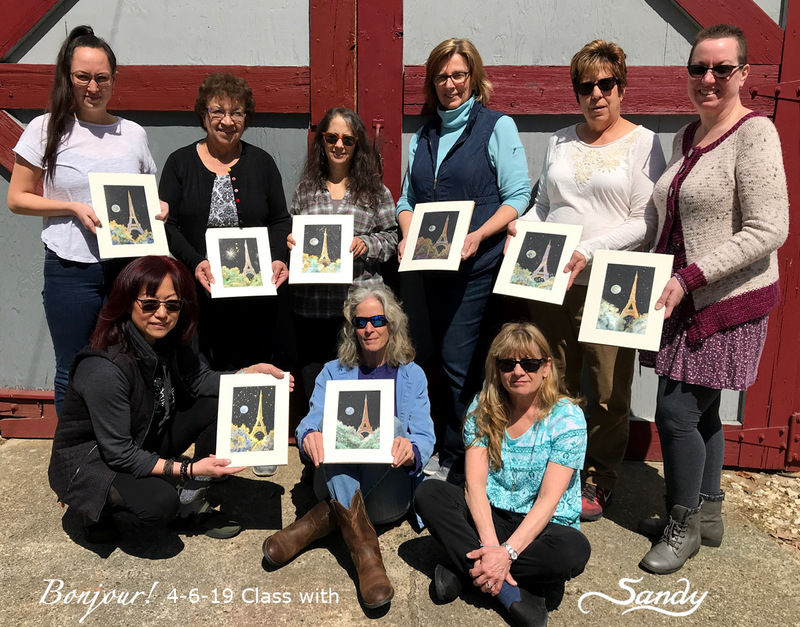 I teach beginners through accomplished professionals all together in one class and the results are nothing short of amazing. 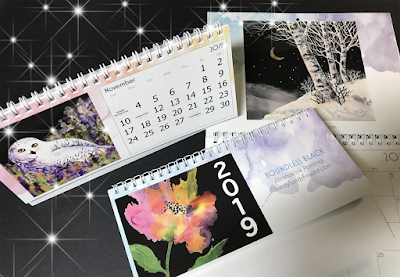 I still have a couple of spots available for October 27th (tomorrow's class), but it looks like that may the last ones that are up for grabs during my last studio session for 2018! Get more information HERE and send me a message to reserve your spot!! 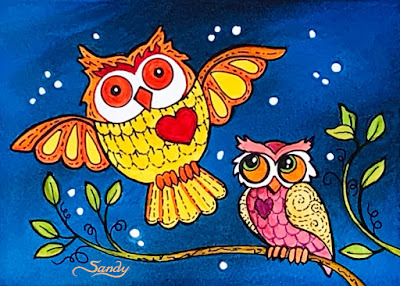 Go ahead, make a difference in your life, Give a HOOT and come and grab yourself some FUN! OWL always be happy to have you here!! Thanks for stopping by! Have a great Fall. "If The Broom Fits, Fly It!" Here is a photo of the painting that inspired my current exhibit "If The Broom Fits, Fly It" at my gallery at 33 S. Main St., Medford, NJ. 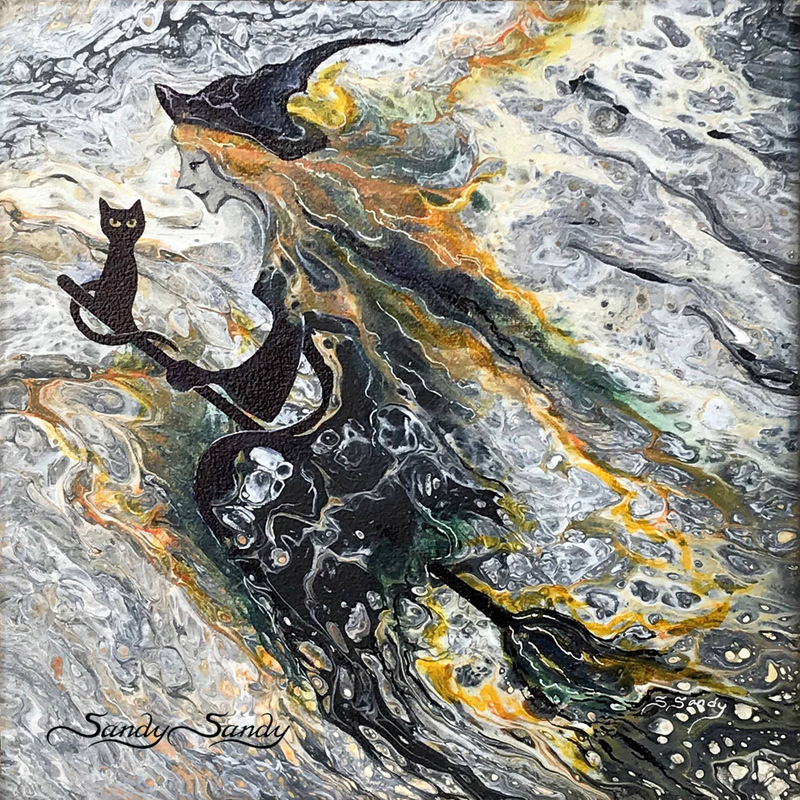 This is an original 12 x 12"acrylic pour on canvas, detailed with alcohol ink which is on display and for sale for only $249. And I also have a 10 x 10" reproduction on 1/2" black foam core, wired and ready for hanging for $60. and it includes a handsome black wooden easel for tabletop display. If you love Fall and Halloween, come see my large selection of originals and prints on display. Stop by and check it out tonight, October 12th from 6-9 for Medford ArtWalk, Thursday, October 18, for Food Truck Night and for the Medford Halloween Parade! Visits are also available by appointment. Just call 609-0268-9106 to schedule or for more information. I also have this image available as a matted 8 x 10" reproduction and other Halloween prints on their way this week here!